Spring is finally here! It has gotten us in the mood to start thinking about making some changes to our home, and this photo featuring Elmira Stove Works appliances has us rethinking our kitchen in the Home Idea Factory. There's something about the character and history behind an old home that keeps drawing me back into the unknowns of remodeling an older home. Right now my project is an old printing factory that has ties to Howard Hughes - it's everything I have ever hoped for, and for once I'll never run out of room. It's always an adventure to find the right "personality Pieces" that will enhance the ambience and architecture of the space. As much as I love the look of a vintage stove or refrigerator, I'm just not willing to give up those modern features like convection, self cleaning, and radiant electric elements. A few years ago I was at the International Builders Show and The Kitchen and Bath Show, and I found the coolest appliance line - it looked vintage but was brand new! It would allow me to have the retro look I love without the concerns of counting on a 60 or 70 year old appliance, and the wonderful choice of colors made me happy every time I looked at them. They even offered a retro styled microwave! I also really appreciated the fact every one of their appliances is handcrafted in their Elmira, Ontario shop, and you could tell how much love and thought goes into every detail. Elmira Stove Works offers so much more than just stoves, and in colors you'll swoon over. 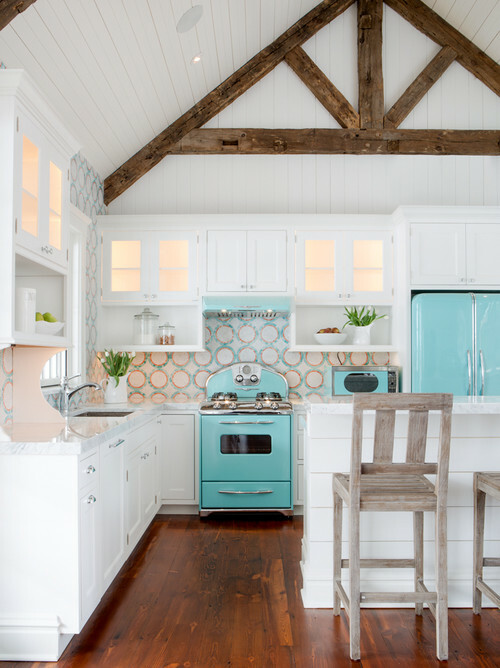 Turquoise is one of the hottest colors in home design right now and their Northstar line features a Robins Egg Blue that is right on trend. There are eight other fun and fresh colors as well if you aren't feeling blue. I love the fact that even though you are getting that retro charm, you can also have the recent innovations I love like a warmer drawer, true convection oven, High-Speed radiant cooktops, and of course a microwave. This range is in their Antique line and offers a true convection oven and a radiant cooktop - in Cayenne Pepper Red it would be the personality piece that every home needs. Man caves and she-sheds are all the rage right now, and Elmira Stove Works has the perfect products for those spaces as well, including keg fridges and a custom airbrushed fridge. I'm thinking about taking over my pool house and turning it into a man cave - these would be perfect! There is a great resource on the Elmira Stove Works website called Create Your Dream Kitchen, and it gives you the opportunity to easily put together your wish list. Thanks in part to Elmira Stove Works for sponsoring this post and for reaching out to us to let us know about these great choices for our home.